As a nation who like our booze, the brewing and distilling industries are somewhat integral to the nation’s prosperity. With many breweries and distilleries shipping overseas, they face high supply and demand, meaning optimum levels of productivity are essential. With this in mind, many breweries and distilleries cannot afford to slow down production due to maintenance and cleaning factors. The brewing and distilling industries are becoming one of the fastest growing sectors, with more and more opening each year whether they be small microbreweries or large corporate distilleries. Brewing generally refers to the production of beer and distilling is the crafting of distilled drinks with high alcohol content such as whiskey, vodka, gin etc. Grains such as barley are are broken down into sugar and then eventually to alcohol through a long process spanning a number of days. Fibrous material, flake material and fine ground material are all common within the brewing and distilling industry; these materials often pose problems to engineers and plant managers concerned with making sure blockages and build-up do not occur, thus slowing production. Different kinds of equipment is used for brewing and distilling, including but not limited to: silos, fermenters, boilers and stills. 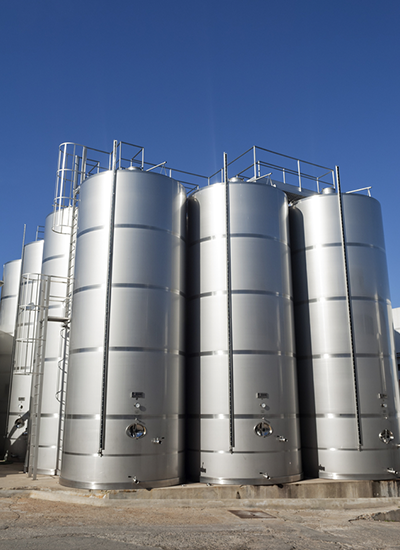 Breweries and distilleries invest a lot of money into the best quality equipment, often manufactured especially to suit individual requirements, therefore they should be kept exceptionally clean. Only a few raw ingredients are used in brewing and distilling such as cereal grains, yeast and water; but they are malted, mashed, boiled, fermented, filtered, distilled and so on depending on the type of drink and the process used to make it. Malted drinks also sometimes use corn and/or rye to catalyse the production of sugars which can result in quicker production, but more of the mess. Clean equipment means increased productivity. Fine ash and dust that completely soak up any moisture in the air is produced from dry grains used for brewing and distilling, with over 50 thousand tonnes of grain being used within the industry each year. You want to make sure you’re getting the most out of the ingredients you invest in, plus you want avoid buildup at all costs. Having an acoustic cleaner installed allows brewing/distilling systems to complete a brewing cycle while reducing downtime and allows for a safe and energy-efficient removal of dry particulate buildup. Primasonic’s acoustic cleaning solutions are used to ensure that ash and dust buildup does not occur using only sound and this guarantees that structures within the plant are not damaged in any way. They also ensure that good hygiene is practiced within silos as the Acoustic Cleaners prevent material build up from occurring inside such vessels. Health implications of residue buildup within the brewing/distilling industry. The maintenance of brewing/distilling equipment not only boosts productivity, but it can prevent some serious health and safety implications. The production of alcoholic drinks is a timely and complex process that makes for messy work that could cause harm to brewers/distillers. Minimising workplace hazards should be a priority within this industry which can be done with the help of acoustic cleaning. In the brewing and distilling industries, dust particles that can come from the raw grain ingredients used in each of these processes can potentially be flammable in hazardous areas. With the potential to cause an explosive atmosphere, you want to make sure that there is no buildup anywhere in your equipment, especially within large silos. Layers of dust are extremely serious. Dry materials cause buildup, blockage or thermal transfer problems. By exposing dust particles to a high energy acoustic pressure wave impact, it will detach the particles from surfaces, avoid buildup and certainly alleviate any hazards. It generates pressure differences on dust and ash particles to remove any unplanned material deposits. What is worrying is that these symptoms do not always develop straight away but can take months of particulate exposure before they manifest as symptoms. Dust particles can also cause dermatitis in serious cases, therefore ensuring dust buildup does not occur not only boosts productivity but promotes a healthier work environment and maximises hygiene standards. If any workers begin to develop these symptoms a full investigation should be carried out and a medical professional should be contacted for relevant guidance. Dusty environments can easily be avoided and particulate exposure can be massively reduced with the help of our acoustic cleaning products. If you have buildup problems within your brewing or distilling company please contact us for our top quality advice and we can definitely help.